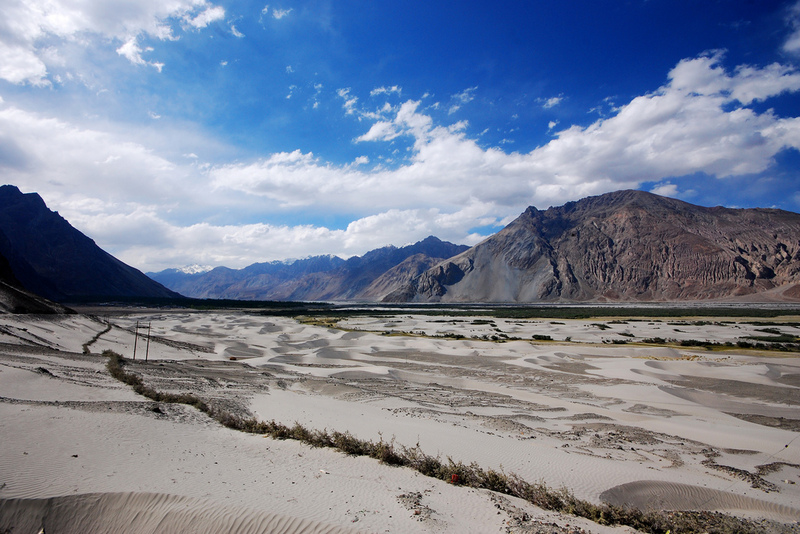 The Nubra Valley is a land of violence and upheaval. Always has been. Hostile geographically, this remote fold in the Ladakhi Himalayas is also fraught with political frictions. Situated a bit ambiguously at the junction of three nations, the Y-shaped Nubra is a victim of indecisive cartography. At various times, India, Pakistan, and China have claimed Nubra for their own. For 65 years, the sounds of war have never been far off from the slopes and streams of this woeful valley. Though India has maintained sway over the length of the Nubra for the better part of three decades, the blood-letting has continued. Siachen Glacier, towering 18,000 feet at the valley’s head, is the world’s highest battlefield, where Indian and Pakistani soldiers keep lookout, freezing in realms of perpetual ice, guns pointed at each other across the cold. I got my first view of the Nubra Valley while flying off the Khardung La pass at breakneck speed. Tam Pel, my Ladakhi friend, was driving, pushing his rundown old van to its limit, slipping on ice and cursing the snow. He rounded two slushy hairpin bends and then we could see it, the entirety of the central Nubra laid out before us, canyons and snow and saw-toothed Tibetan mountains, the work of an angry Creator knifing up his creation. We descended lower, through boulder strewn moonscapes, following the only road into the valley, until we reached the army checkpoint of North Pullu. Here, where we were obliged to stop and show our permits, I got my first glimpse of the curious relationship between security and tourism. While machine gun-toting soldiers patrolled the barricades and bunkers, a handful of bundled up Indian travelers sat laughing around a plastic table beside a make-shift snack stand. Men in fatigues were selling candy and steaming cups of tea to the steady trickle of tourists who were required by law to pause at the checkpoint. Clever marketing really. I bought a cup, got our permits stamped, and we were on our way. The van was making good time. The road lipped the yawning mouths of precipitous canyons, which fingered out, like throbbing veins, toward the ridge behind us. Scree and stone dominated the landscape, but were occasionally interrupted by forlorn little patches of green where a snowmelt stream was cutting down the slope en route to the valley floor. Each of these struggling pastures was populated by small herds of bleating goats or lumbering yaks, enormous mounds of hungry hair hovering over the grass. Bend and curve, the road traced the vertical walls of countless chasms, leading us always toward the confluence of the Shyok and Nubra rivers far below. We made steady progress along this road for an hour or more, until we burst out of the gorge. Poplar trees lined the Shyok riverbank directly beneath us. We rounded a bend and Tam Pel had to slam the brake into the van’s bare metal floor. A line of traffic was sitting motionless in the road ahead. Cars, lorries, and motorcycles formed a blockade of stationary frustration curling off around the next turn. With a 200-foot drop on our right side, and a broken, menacing cliff rising on our left, there was no getting around, and nothing to do but wait. Tam Pel jumped out and ran ahead to find out what the problem was. I followed in his wake, discouraged by the number of drivers who had abandoned their cars, and were just sitting on the road. At the head of the line, a surly, duck-butted woman with an old orange road worker’s vest over her long dress stood frowning with arms crossed. She informed us that some type of construction was being done for the next kilometer, and wouldn’t be finished for another hour and a half. After giving us the news, she plopped down on a rock and looked the other direction. Her job was, evidently, to guard the three cones that blocked the way, and work very hard at ignoring the glares of angry motorists. Tam Pel was livid, and joined a fuming circle of other drivers who were nursing their rage by insulting the road authority. I resigned myself to the wait and turned to head back down the line toward our van. There were lorry drivers sitting under their trucks, groups of leather-clad tourists pouting next to their Enfield motorcycles, car-loads of sightseers dozing in piles on back seats, and local villagers milling around bombed-out old buses. Near our van, I spotted two large army transport trucks. Their ironic green camouflage in that brown world really made them stand out. A varied assortment of soldiers stood in little groups chatting or sat in the shade, sipping from water bottles. One was lying in the middle of the road with a towel over his face while his cell phone blasted Led Zeppelin music from its perch on his chest. I was trying to remember the name of the song (it was “Dazed and Confused”) when another soldier approached me from behind the truck. “Is it cold up there,” I asked, just making conversation. I looked at his face. He was young, maybe 25, with a downturned mouth, and seemed nervous about his looming assignment. “What do you miss most about Gujarat?” I asked him. He thought for a brief moment before answering. “I miss my friends,” he said, then continued, “and also my mother’s potato curry.” I smiled and thought about my wife’s biscuits. “So you are not afraid?” I prodded. He was pensive. “I am not scared of fighting,” he said. “Really, my only fear is cold, and avalanches.” He had a point. I had read that last year 150 Pakistani soldiers were killed on the other side of the glacier, when some of the mountain broke off and buried their headquarters. “How many soldiers are up there?” I asked. “Maybe three thousand,” was the reply. “Does that happen often?” I enquired. “Yes,” he said, “for many years this was a valley of blood. Constant fighting up and down. But now, not so much.” From 1984 up until the cease fire in 2003, Pakistan and India traded punches on the roof of the world, with neither gaining much ground, but losing a lot of lives. Danuj told me that India would like to draw down the number of troops at Siachen, but since the Kargil War in 1999, there is no chance of that. In that year, the Indian army vacated it’s lofty mountain posts to the west during the winter months, and the Pakistanis moved in and took control of the high ground overlooking the vital Kargil road that connects Ladakh to Srinigar and the rest of Kashmir. The Indian army had to root them out, and something around 1,500 soldiers were killed. “Yes, I understand the conflict,” I said, “but I need someone to tell me why this glacier is so important in the first place. What is it useful for?” Danuj just smiled and looked at his shoes. I felt bad. It was obvious that I had embarrassed him. But I don’t think he was embarrassed for not knowing the answer to my question. I think he knew the answer very well. I think he was embarrassed that over the years, more than 2000 young men have been shipped off that glacier in body bags. I think he was embarrassed that two countries with huge populations of starving children are spending 500 million dollars a year fighting over a piece of ice. No one lives there and nothing grows on it. It’s just ice. I think Danuj knew all this, but his resolve to do his duty was ironclad and unshakeable. I shouldn’t have embarrassed him with my questions. We stood there for a while, the two us, and stared out at the river, our eyes tracing its snaking path across all that dust and sand, heading north, toward Pakistan, toward the enemy. After some moments, Danuj picked up a rock and hurled it as hard as he could at the water, but stones flung off a ledge never go as far as you expect, and it bounced and landed with a thud among a million others, well short of the bank. Eventually, we saw the big paver come lumbering around the bend in our direction, toting a haggard group of dirty and tired looking men. Their labor was finished for the day and they were headed back to their makeshift camp. The fat, surly woman pushed on her knees, got to her feet, and moved the cones, and just like that, it was time to go our separate ways. I bid Danuj farewell, and wished him luck out their on the glacier, with nothing to do but worry about avalanches. He smiled at me graciously and shook my hand. He called to some of his men, sitting off under the cliff’s shadow, and they began clambering back into the truck. Tam Pel shot off over the sticky new asphalt and before long we were at the seam of the two rivers and heading up the western fork toward the ancient town of Diskit. Only now, from the sand-papery bottom of the Nubra could I see just how desolate this valley really was. We were surrounded by undulating dunes, rolling off to the north and south. Towering dust devils, more than a hundred feet high, were cycloning hurdy-gurdy over the shifting sand. At one point, I counted seven of them, simultaneously slithering across the sky. Only along the banks of the Shyok, eating a path up through the waste, did anything green dare to grow. Diskit is the capital of the Nubra Valley. A low, dusty village among a stand of poplar trees, it sits in the shadow of a Buddhist monastery, which is perched precariously on the steep slope above. Diskit’s main street is unremarkable, save for a line of frantic Ladakhis selling bags of dumplings to passing soldiers. When I waved off one of these hawkers, she removed a dumpling from a bag and tried to forcibly shove it into my mouth. She was convinced I’d change my mind if only I could get a taste of her culinary prowess. She was right. I bought the bag. The compact old section of Diskit is considerably more inviting, all cobblestones and stupas and streets packed with furry little donkeys. After a more than ample half hour stroll through this hamlet, we resumed our journey, making our way farther north along the Shyok, toward Hunder. The intervening five miles quickly morphed into a sea of sand dunes. From our high position on the road, I could see that they blanketed the ground for miles, clear across to the Eastern ridge, transforming the entire valley floor into a mosaic of brown and beige. Tam Pel smiled and pointed out the open window, “Ah, and now you will see camels!” he shouted. Sure enough, down to my right, I could make out the lumbering forms of five two-humped, Bactrian camels slowly pursuing their shadows across a dune. The sun was just beginning to scrape the tops of the western ridge when we bounced into town. Until recently, Hunder was as far as foreigners were allowed to go. Now, however, I am told that with a special permit, it is possible to continue up the rapidly narrowing valley as far as Turtuk, smack on top of the “line of control” with Pakistan. I had no such permit, so Hunder would be my terminus for this branch of the valley. More than anywhere else in the Nubra, Hunder was the epitome of that surreal blend of conflict and tourism that has become ubiquitous here. Because of it’s position near the front lines, there is a large army base on the edge of town, and camouflaged soldiers swarm through the area, toting guns and wearing serious expressions on their faces. But the massive sand dunes and camels also make the town the single biggest draw for sightseers in the valley. Tam Pel took me out beyond the settlement where a few tents were set up, offering camel rides to giggling tourists. Probably twenty people were snapping photos and readying themselves to mount one of the bored-looking beasts for a thirty minute ride through the sand. Tam Pel told me that though there are still a few wild groups of Bactrians wandering through the dunes, the majority have now been domesticated and pressed into service, toting rowdy travelers through the camel’s former habitat. The azure sky deepened toward indigo and then black as we made our way back into town. A three quarter moon in cloudless skies illuminated the dunes that evening, transforming them into ghostly pale shapes, foamy swells on a silent sea. Next morning, we made our way back toward the south, following the Shyok river to the junction of the Y. Veering to the left, Tam Pel guided his van across the river and started up the much tighter eastern fork, carved over eons as the Nubra river flowed out of the perpetually melting Siachen Glacier. At this point the road degraded considerably, and we found ourselves thrown to and fro as Tam Pel struggled to find the groove. Off to our right, a long waterfall squirted directly out of the sheer rock, the punctured mountain slowly leaking. My real desire in venturing up this side of the valley was to get as close as I could to Siachen. As we moved north and entered Sumur, a squat little town hunkered down on the riverbank, I noticed that the concentration of tourists had diminished significantly on this side of the valley, where the roads were rougher and the sights were fewer. Most of the other vehicles on the road were military trucks and sputtering lorries delivering scant supplies to the handful of towns in this direction. Near a junction in the road, a herd of goats were standing on hind legs, carefully gnawing at a thorny patch of shrubs sprouting from the ruins of an old palace. The palace was abandoned and there was no one around except for the lonely goatherd, who watched us with interest while picking his nose. Tam Pel said that we could climb to the roof, and assured me that our weight would not bring the decrepit building down on top of us. After a moment’s hesitation, I began making my way up several flights of cracking steps. There were many large holes in the floors, just begging clumsy visitors to tumble cartoonishly to the level below. After a final scramble up a wooden ladder, we emerged on the roof and breathlessly crept toward the edge. We could see up the whole length of the Nubra, a deeply creased wrinkle of water, rock, and sand, interspersed with little fields of green: agriculture and life on a miniature scale. Driving farther to the north, the valley seemed to close in on top of us. The tiny village of Pinchamik looked like nothing more than a collection of prayer wheels, unendingly spun by a parade of elderly Buddhists, trooping back and forth to their vegetable patches. Before long, we rolled into Panamik, a one-street village known for its hot springs, and the end of the road for foreigners. There were some irrigated fields, and out in the green barley shoots several villagers, short weather-worn Ladakhis, were bent double, looking like tombstones, and casting long shadows in the cool afternoon. I stood out at the edge of the village, with 1800 miles of India at my back and looked off north, up the Nubra, to the place where the glacier comes crashing down into the valley floor. This was as close as I could get. I thought about Danuj unpacking his supplies at the base camp and thinking about his mother’s cooking. I wished him well, but was glad I was not with him. This valley had proven plenty long for me, and still it wound on, seemingly forever. It really is amazing. Every time I think I’ve come to the end of the road, there is always a little more. Chris Watts is an EthnoTraveler contributor.